All of us at some point need to remove software from our computers which we no longer want or need. Sometimes more than one software install at once. Either that or you are looking at a friend or family members PC and they have tonnes of useless toolbars and other bits of old software which could really do with being removed. For many of us, the tool we would turn to without hesitation is Revo Uninstaller, and rightly so, it’s a great tool. But a problem arises with Revo when you would like to uninstall several pieces of software at once. Each one has to be done individually and can be a bit of a bind when there’s a lot to remove. 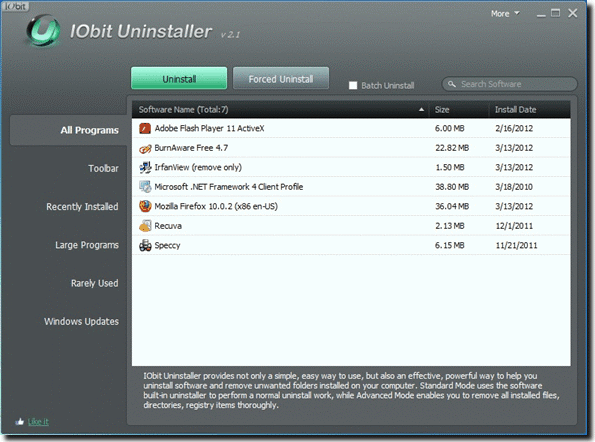 IObit Uninstaller is an uninstall tool similar to Revo but has an added advantage that you can select multiple uninstalls to be performed all in one go called a ‘Batch uninstall‘ and this can be a real time saver. Standard Uninstall works as the Windows built-in Add/Remove Programs function does, while Advanced Uninstall scans the Windows registry and hard drive for any possible installation leftovers. Now includes a more secure and deeper scan called ‘Powerful Scan’. 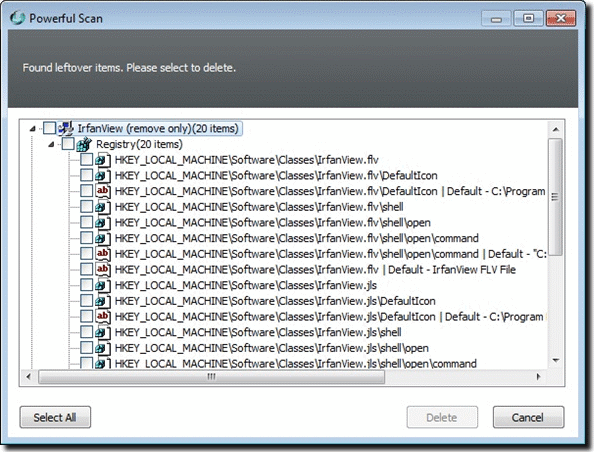 Locate the software to uninstall manually if you cannot find it in the list. 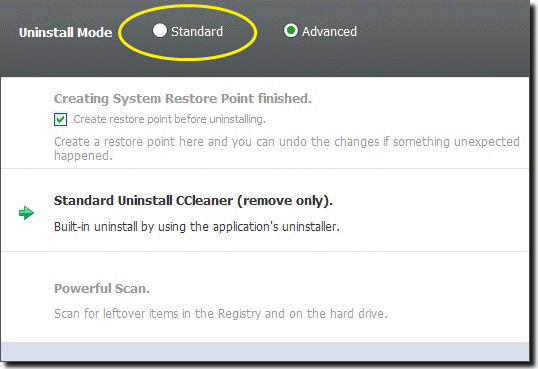 You can choose whether to create a restore point or not when using advanced mode. As you can see, it’s a pretty familiar looking uninstaller interface with the exception of the buttons down the left which groups the software together into different types, and the function we’re looking for, the ‘Batch Uninstall‘ tick box. The ‘Forced Uninstall‘ option lets you manually find what you want to remove if it’s not in the main list. Put a tick in the box and the software list will have changed slightly; now there’s a tick box next to all installed software ready for you to select which ones to install in the batch. Tick what you want to remove and click ‘Uninstall. Your selected software will now start being uninstalled. If you only want an ordinary uninstall and not the more advanced one that will scan the registry and system for left over traces, make sure to click the ‘Standard‘ option. The disable create a restore point tick box will only be available with the advanced option. If you’re going advanced, when all the uninstallers have finished, press ‘Powerful Scan‘ and after a short wait, a window showing any leftover traces will pop up. Please take care and carefully go through the list to see what can safely be removed. Once you have selected what you want to remove, click ‘Delete‘ and you’re finished! I have found this option to be a real time saver when looking at someone’s PC and finding it full of junk they never knew they had. IObit Uninstaller is compatible with Windows 2000, XP, Vista, Windows 7 & 8. @RAY , Thanks sir, Iobit does good for me (altogether with Revo & Geek ! ) Iobit ‘s feature helps me in removing Kaspersky AV 2016 browser extension’s left overs . kav 2016 asks me before adding security extension to my chrome browser and even after a denial, installs it partially every now & then ! that is picked & solved by Iobit & not by chrome ! Thanks & Regards. Sorry just looked at the post again hal9000, i remember other blogs here from different authors and been called Raymond. Thank you Raymond this is interesting i never considered batch uninstall, probably following on from windows unistaller as in one program at a time, something i may try and see how long it takes to uninstall multiple programs. Allways good to come across something different to think about. Raymond thanks very much for this software. It would have come in handy about two weeks ago when I had to remove about 30 Programs individually using Revo Uninstaller! It goes without saying that it was a long laborious process. However, Uninstalling unnecessary programs; toolbars etc. is a MUST as the first line of defense in removing a cluttered Malware-infested computer as was the case recently when a customer had 200 assorted pieces of viruses; trojans and rootkits in his system! Anyway, I am thankful for this download and have already installed it on my USB “Wonder” Stick to do Battle next time with those who get up every morning whose sole purpose in life is to Wreak Havoc on an unsuspecting customer’s desktop and/or laptop! This sounds promising. Thanks for posting!